I make killer salsa and guacamole. I’m not bragging. Seriously…it’s one of my few talents. Anyone who has had it, loves it. I've had people who think they don't like guacamole (um, that stuff in a jar is NOT guacamole!) say they absolutely love it! So it’s not surprising that it makes a regular appearance at our dinner table. Friday night, one of my design team members was working on a recipe album. Now, I have never really understood the purpose of doing recipe albums or boxes up scrapbook style. I mean come on! How can I work on something like that when I am a year behind scrapbooking my kids (yes, Noah is 4 months old, and doesn’t have a single page devoted to him yet)? But I always smile politely because, hey, they are kind of cool even if it's not my cup of tea, right? As I cooked, I thought about how appetizing it looked with the greens of the cilantro and the red of the enchilada sauce…and it hit me. How often had I craved the regular dinners my mom made when I was growing up? I can remember walking into the kitchen and the delight I would feel when I realized she was making one of my favorites. I make good chili, but I can’t make it exactly like my mom does. And although my brown chop suey is good, it’s not exactly my moms. I’ll be honest though, I’ll be happy if I never had pepper steak and stuffed green peppers again! Man, I hated those! My kids will have their favorites too, I’m sure. And I thought, wouldn’t it be nice if when they are out on their own, they could have those recipes? Better yet, in the far away future, when I am gone, they can look back fondly and remember warm family dinners...and make them for their kids. So I was wrong, and I ahve learned my lesson. It’s not a silly project – it’s a brilliant one…one I plan on doing . I’ll be making my own recipe box this week spending only 10 minutes a day or less. Check back every day to see my progress. I chose the ugliest photo box I could find... recycling at it’s best, making something beautiful out of a yard sale wannabe Follow me along...and if you send me your recipe project, I'll share my guacamole and salsa recipes! Paint the edges where the paper will bump up. 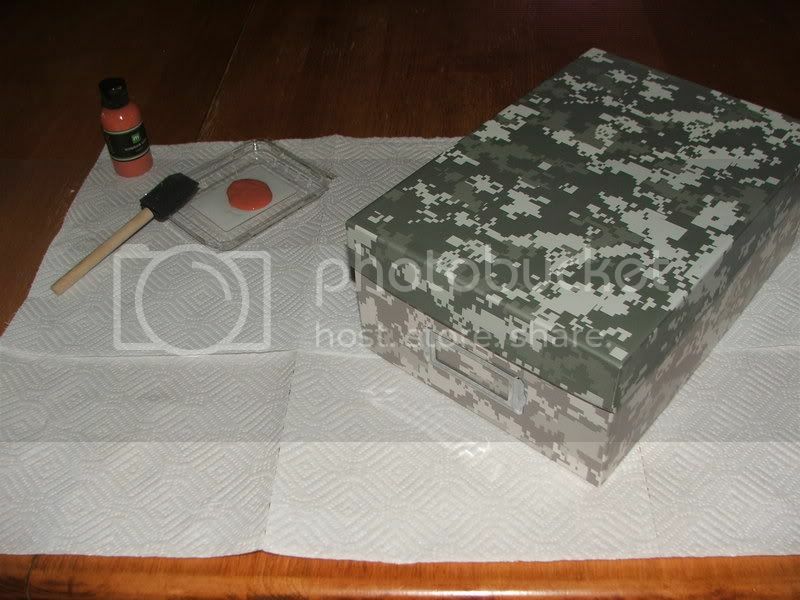 No need to waste paint and do the whole box, just the corners and edges will do. Tune in tomorrow! 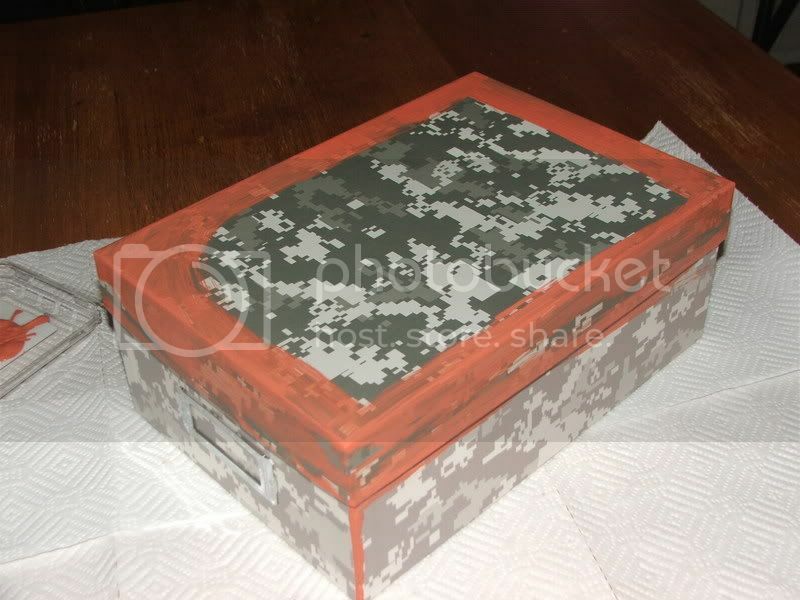 I'll start adding paper to make my ugly box into a beautiful recipe box.